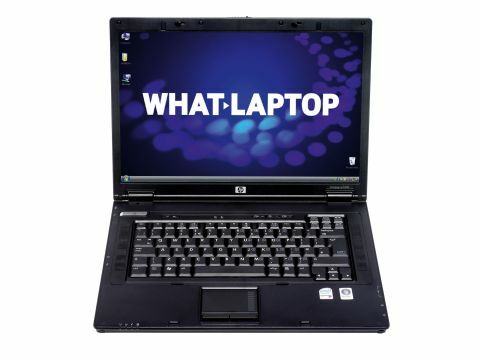 While many laptops are designed for consumer use, the HP Compaq nx7400 (£622 inc. VAT) is an entry level corporate system. Offering power and stability, it stands out as the choice of the mobile professional. Suiting its corporate audience, it has a reserved grey design. Strong throughout, the chassis is tough enough for frequent travel use. Its 194-minute battery life, under test, is good, and its 2.6kg weight provides comfortable mobility on short journeys. Usability is outstanding. The keyboard is well made and responsive, although the typing action may be too firm for some users. The touchpad is equally comfortable to use. Improving tactility, the mouse buttons are made from soft rubber for extra grip. While previous models of the nx7400 used Windows XP Professional, the latest version opts for Windows Vista Business. Providing the same features as XP Pro, Vista adds such tools as data backup, anti-spyware and built-in PDA synchronisation to name a few. Improving visibility outdoors or under office lights, the 15.4-inch screen has no glossy Super-TFT coating. Colour and contrast are reduced as a result, but reflections are eliminated, making this the best choice for working on the move. Powered by an Intel Core 2 Duo processor, performance is strong. Although the HP is designed for business use, there's more than enough power for media editing tasks, as much as writing letters and creating spreadsheets. Predictably for a corporate laptop, graphics performance takes a backseat. PowerPoint presentations and videos run smoothly, but don't expect to play much more than Vista's own built-in Chess and Solitaire games on your travels. It also features a dual-layer DVD rewriter, so you can back up as much as 8.5GB of data to compatible discs. This is handy, as the 80GB hard drive is smaller than its rivals in this test and there is no support for any media card formats. While no extra features separate the HP from other laptops at this price, a basic software package is included for DVD creation and playback. A range of proprietary HP tools lets you back up and secure your data quickly and easily. With its impressive power and usability, the HP Compaq nx7400 is a great corporate laptop. While its limited features and lack of a Super-TFT screen mean it's not the best choice for home multimedia use, it's an ideal laptop for the mobile worker on a budget.